Fat storage or lipid metabolism is gradually becoming a topic of daily concern. The core of lipid metabolism is the adipose tissue, whose dysfunction disrupts physiological homeostasis and endangers human health. Seipin gene mutation leads to a severe human metabolic syndrome termed as type II congenital generalized lipodystrophy (CGL2). CGL2 patients manifest as almost total loss of adipose tissue and other serious complications, especially the fatty liver and insulin resistance. Seipin gene encodes a highly conserved endoplasmic reticulum (ER)-residing protein and is conserved from yeast to human. The pathogenesis of CGL2 and the molecular function of Seipin protein have not been fully understood. Prof. HUANG Xun's group at the Institute of Genetics and Developmental Biology, Chinese Academy of Sciences, collaborated with SHUI Guanghou’s group, WANG Guodong ’s group and DING Mei’s group at the same institute, revealed that Seipin can regulate adipose tissue lipid storage via calcium (Ca2+)-dependent mitochondrial metabolism. HUANG Xun’s group has a long-term interest in studying lipid metabolism regulation. Previous study of his group indicated that Seipin regulates fat storage of adipose tissue and non-adipose tissue in a tissue-autonomous manner in Drosophila Seipin mutants (Tian et al., PLoS Genetics, 2011). Further work focusing the adipose tissue found that Seipin interacts with ER Ca2+ channel protein SERCA to promote fat storage by maintaining the cellular Ca2+ homeostasis (Bi et al., Cell Metabolism, 2014). However, the downstream responsive effectors of calcium signaling mediating the lipid storage remained unknown. In the recent study, HUANG Xun's group performed molecular profiling of Drosophila wild type and Seipin mutant fat tissues by proteomic, transcriptomic and metabolomic analyses. The multi-omics data suggest that the mutant fat cells suffer from a metabolic bottleneck in channeling glycolytic metabolites to mitochondrial TCA cycle. The stable isotopic metabolic flux tracing experiments supported this hypothesis, leading to further scrutinize the mitochondria in the mutant fat cells. The results revealed multiple defects of the mitochondria, including dramatic reduction of ATP production, decreased mitochondrial respiration, high-frequency mitophagy and inadequate mitochondrial Ca2+. Since the Seipin/SERCA complex is required for ER Ca2+ balance (Bi et al., Cell Metabolism, 2014), they proposed that in Seipin-deficient fat cells, the imbalanced ER Ca2+ causes the reduction of mitochondrial Ca2+, which leads to the reduced activity of TCA cycle and decreased production of the substrate (citrate) for lipogenesis, and eventually lipodystrophy. The group also presented evidence that the dSeipin mutant lipodystrophy can be rescued by genetically rebalancing the mitochondrial Ca2+, dietary supplementation of the metabolites (citrate) or drug administration activating the key mitochondrial metabolic enzyme. 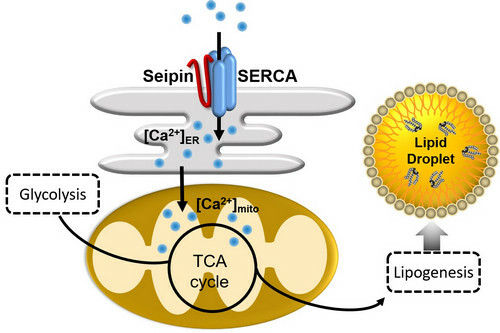 The findings, revealing a “Seipin/SERCA-Ca2+-mitochondrial metabolism-fat storage” axis, have been published online on July 26th in EMBO Journal entitled “Seipin regulates lipid homeostasis by ensuring calcium‐dependent mitochondrial metabolism”. This study not only provides a new insight into the molecular mechanism of organismal lipid metabolism regulation, but also suggests multiple potential therapeutic approaches for CGL2 syndrome. The work was supported by the Strategic Priority Research Program of the Chinese Academy of Sciences, the National Key R&D Program of China and the National Natural Foundation of China.